I am on an Amtrak train bound for New York after spending a day in Haverhill, MA. Haverhill is about an hours train ride from Boston. The scenery of this area is stunning with its wooden buildings, impressive landscapes and greenery. Haverhill is a small city of around 61,000 and used to be the women’s shoe manufacturing centre for the world. The shoe manufacturing business eventually collapsed leaving a number of factory buildings dormant. One building has been redesigned into condos, however the quaint six story red brick building on Duncan Street is home to the Mason and Hamlin piano factory. I was greeted at the train station by the company Plant Manager Chris Blouin and led to a building with old wooden floors, wooden beams and of course those red bricks. Taking in the aroma of timber that was in the air I was taken up to the sixth floor in the piano lift where I met up with Bruce Clark, Lead Design Engineer. I met Bruce earlier this year on the Gold Coast at a seminar on Mason & Hamlin and the WNG piano actions. Bruce is a man with a lot of knowledge about design and manufacture and is willing to impart with that knowledge to an eager ear. I thought I would be in the factory for about 2-3 hours however after 6 hours, I thought I had better leave and return to New York. Bruce was intent in showing me all details of their piano manufacturing process plus their jigs that have been designed in-house to streamline the process plus their methods of placement of all the parts in the exact position and building up on these methods to completion. These pianos are very close to being what I call handmade as the processes they use are designed and tested and produced in the factory with precision that many other manufacturers would envy. The quality of the veneer work is beyond belief. Where other factories have large sections and dedicated staff to complete this work, Mason & Hamlin perform this all in one small section in the factory. The case finishes, either polyester gloss or satin lacquer is of a high standard. Without sounding critical of the designs, these pianos are almost over engineered. They are finished well and credit must be given to these dedicated craftsmen. 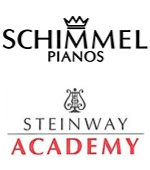 Brian Wilson is one of the most highly trained and experienced piano tuners in Australia, and one of only a handful of concert technicians trained at the Steinway & Sons Academy in both New York & Hamburg.